I actually finished my secret new design over the weekend and kinda forgot to post it. Heh. Sorry. Anyway, this design is for sale on Ravelry with the note that all the proceeds from the sale of this design goes directly to the James Cancer Center. I make nothing on these. The prototype is going to be framed and entered in a raffle. Every person who donates $75 or more to my Pelotonia ride is entered in a raffle to win this. I'm making another to raffle at my second annual F*ck Cancer Cabaret. 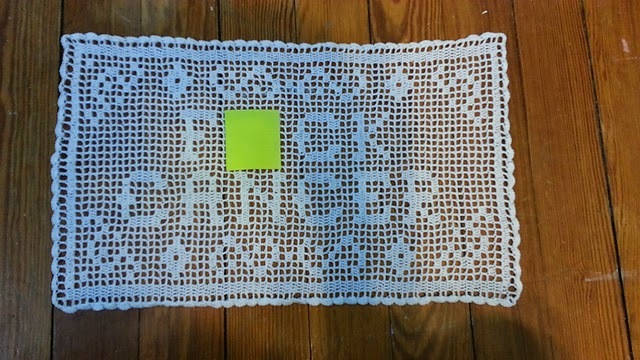 The F*ck Cancer doily. Because F*ck cancer!! Please visit the link about and make a donation to my ride if you can. Every dollar helps. And every penny donated goes directly to the James Cancer Center. No one else's pocket. So you can feel secure that your donation will help fight cancer.